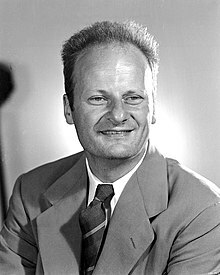 Hans Albrecht Bethe (German: [ˈhans ˈalbʁɛçt ˈbeːtə]; Julie 2, 1906 – Mairch 6, 2005) wis a German an American nuclear pheesicist wha, in addeetion tae makkin important contreibutions tae astropheesics, quantum electrodynamics an solit-state pheesics, wan the 1967 Nobel Prize in Pheesics for his wirk on the theory o stellar nucleosynthesis. ↑ 1.0 1.1 Lee, S.; Brown, G. E. (2007). "Hans Albrecht Bethe. 2 July 1906 -- 6 March 2005: Elected ForMemRS 1957". Biographical Memoirs of Fellows of the Royal Society. 53: 1. doi:10.1098/rsbm.2007.0018. ↑ Horgan, John (1992). "Illuminator of the Stars". Scientific American. 267 (4): 32. doi:10.1038/scientificamerican1092-32.